Students and parents mingle at Career Options Night. ETHS hosted their first fair highlighting careers that do not require a college degree. Students, parents and community members learned about career pathways that do not need college degrees at a career event hosted at Evanston Township High School on Thursday. ETHS hosted its inaugural Career Options Night, an open house showcasing career opportunities that do not require a college degree. 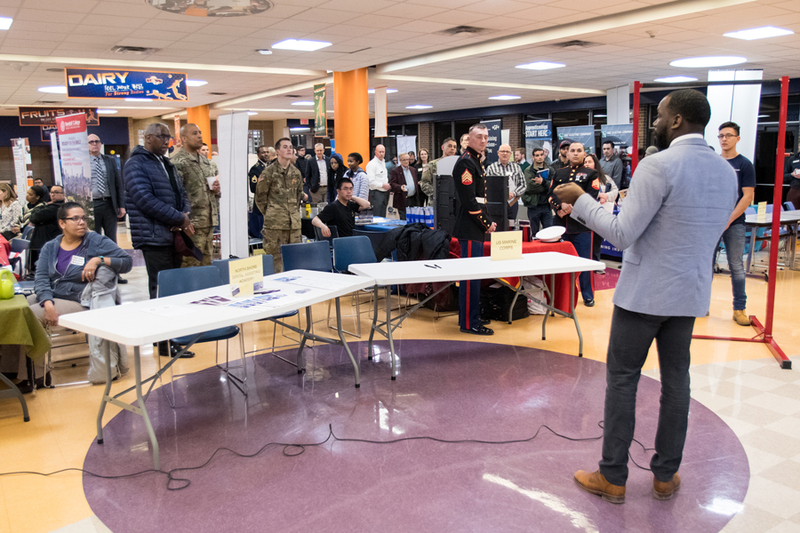 The event — which included over 30 recruiters and organizations — included a career fair and informational sessions on pathways such as apprenticeships, military jobs and other work opportunities in Evanston. ETHS postsecondary counselor Michelle Vazquez said the purpose of Career Options Night was to inform students, parents and the community about options after high school that do not include college. She added that ETHS has done other career-related events, like WorKIT Week and Military Visit Week. The event was co-sponsored with the city, Evanston Lighthouse Rotary Club and the Youth Job Center, though ETHS was the primary sponsor, Vazquez said. U.S. Air Force Staff Sgt. Jacob Bailey, who ran one of the tables at the fair, said jobs at the Air Force ranged from mechanical to information technology jobs, and that a college degree was not necessary for many of them. The career options event was the first career fair he attended, Patil said, adding that engineering was one path he was considering. “These events could give me a good idea of my future, and the future is important to me,” Patil said. Youth Job Center career advisor Erica Rodriguez said the event mattered because it pushes back on the idea that people have to attend college to succeed.